This article was written by Marianne Hopwood – science teacher, STEM expert and home educator. It was first published on AcornSTEM, Marianne’s blog about STEM activities parents can do in the home. Hands up anyone who has a child who dreams of going into space! 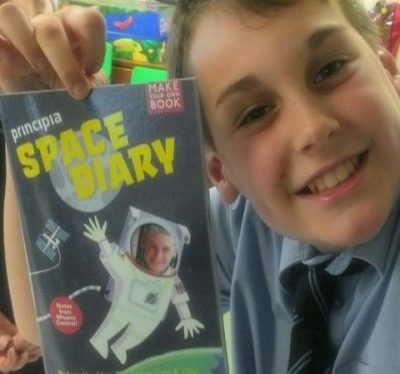 My two boys certainly do, so when I found out about the opportunity to buy ‘make-your-own-book’ Space Diaries based on Tim Peake’s Principia (pronounced ‘Prin-kip-ee-ah’) mission I jumped at the chance. After waiting with much anticipation our diaries arrived last week and have already proved a big hit. The kids dived straight in with the Pre-Launch Chapter, hopping around and timing each other completing physical activities (assisted by our Bearded Dragon), watching videos about space suit design (and laughing hysterically at the idea of space nappies) and drawing plates with a nutritionally balanced meals which we then cooked for dinner that night (luckily they drew jacket potatoes and not ‘crickets and rice’ as they had initially suggested!). The floating practice was deemed insufficient so the boys wangled a trip to the local swimming pool to work on their ‘EVA’ technique, I think this is a term they picked up from Thunderbirds as they repeatedly shouted “I’m going to have to go EVA, Gordon!” before plunging off the swim ring. The diaries are linked to a mission website and enable children to learn about astronauts, and the STEM professionals who support them, through engaging cross-curricular activities. I like the level of representation of a variety of different linked careers, including examples of female STEM professionals. Very few people currently go into space, but a huge number are involved in support roles and related industries, so it’s great that children could aspire to a profession that will send humans to places we haven’t even dreamt of yet. Produced by education publisher Curved House Kids with the aim of exciting kids about STEM learning, and drawing on teachers and experts to review and develop the materials (including lesson plans) this resource is extremely useful for teachers, home educators, clubs and families. 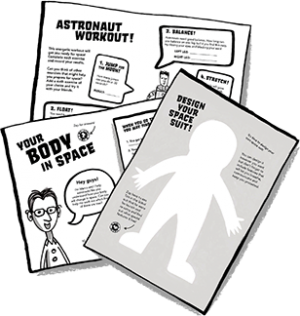 The Space Diary can be downloaded for free chapter by chapter, or resources pick and mixed to fit interest areas, so you don’t have to commit to planning a whole term around the book if you are short of time. Curved House Kids has a focus on visual literacy – the ability to make sense of information presented as an image – and the resources they have produced for this project are a real breath of fresh air in that they present good quality information that will appeal to a wide age range, without excluding kids who are not yet confident with reading and writing (I have just deleted a paragraph here where I ranted about the existence of the ‘does it float’ activity in the National Curriculum Specification for Science at KS2. But seriously, 8 year olds being asked to see if an object floats in a bucket of water!). This approach means that, at 5 and 7 years old, both Toby and Ollie can engage in the diary, with Toby requiring a little more help in some areas but able to complete other sections independently. For teachers and others following the National Curriculum there is a section on the website covering Curriculum links and differentiation ideas. Each activity can therefore be tailored to the individual child to ensure they can achieve and feel good about themselves – really important as the aim is to enthuse kids about STEM learning. 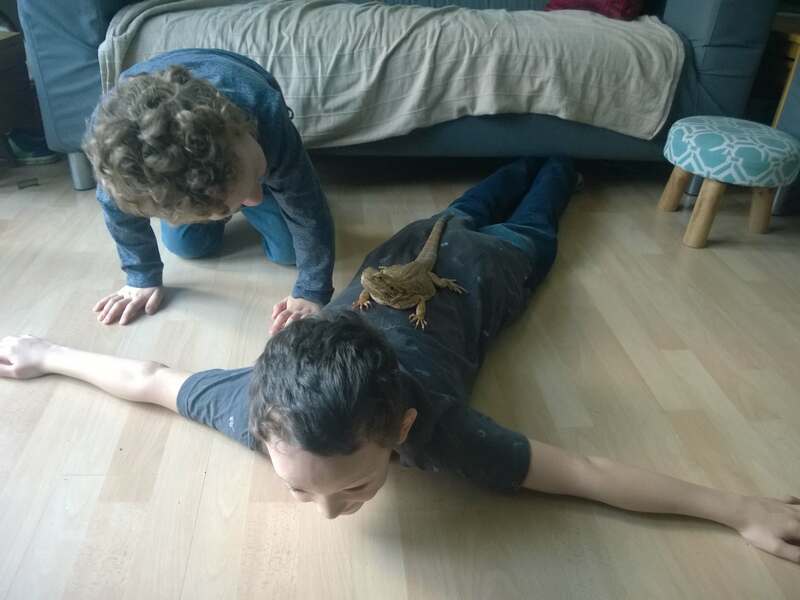 The mixture of activities throughout the diary means that there is no chance the kids will get bored of it, and having completed the first chapter last week Ollie has asked about every two hours for the last four days if it is time to do some more yet. 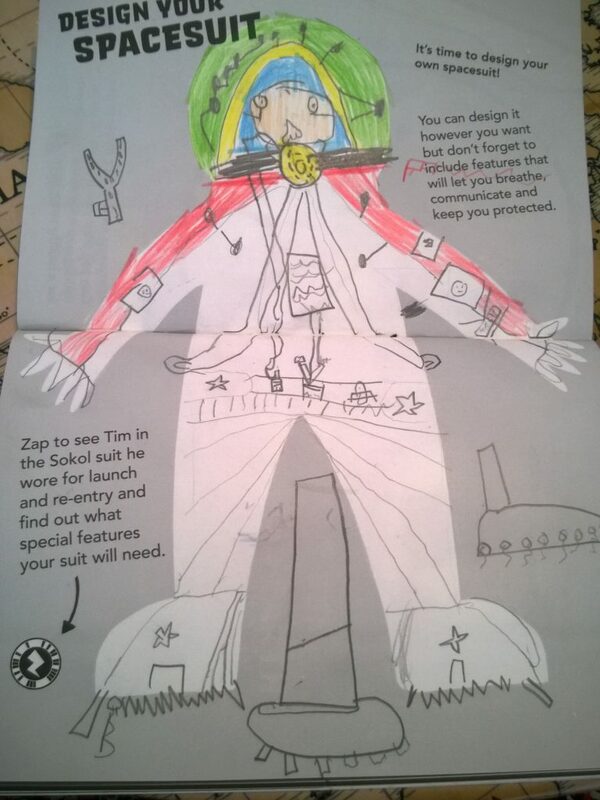 The diary has also provided a springboard into other activities, such as going to the Science Museum in London this weekend to see Toby’s favourite rockets and Tim Peake’s Soyuz capsule currently on display. We were a bit late getting to it after an afternoon spent in the Wonderlab upstairs, hence the museum employee in my photo heading our way to usher us out. He was perfectly polite, but in my head he was shouting ‘No! No more science for you! You have learned enough for one day!’. So far the Principia Mission Space Diary has inspired us to do some cooking, swimming and a museum trip, we’re looking forward to seeing where it takes us next!